The upper attachment at almost forces . 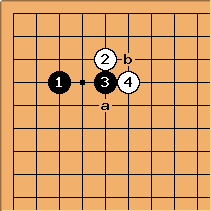 Unlike the 4-4 point low approach upper attachment joseki, there is little for a side switch to occur in this joseki. Typical followups include a and b. 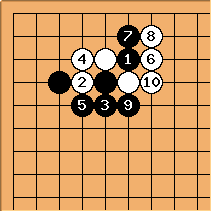 White gets the upper side while black gets the corner and the left side. Black can also cross-cut at . 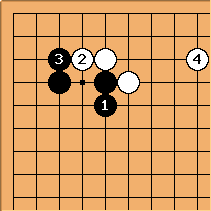 The end result is that black has better influence outside, but white is very thick and cannot be attacked. 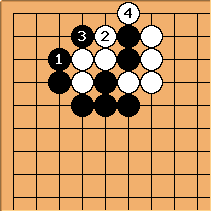 For more on this joseki, see attach-crosscut corner patterns.